Euclid in his work “Optics” (around 300 B.C. ), the first scientific work to relate the theory of vision to Mathematics, noted that when observing a sphere from a fixed position it is possible to view more than half of its surface. As each eye views the sphere from a different viewpoint, the visual perception is created by the images of two spherical caps, the combined result of which may, under certain conditions, add up to more than a hemisphere’s surface. 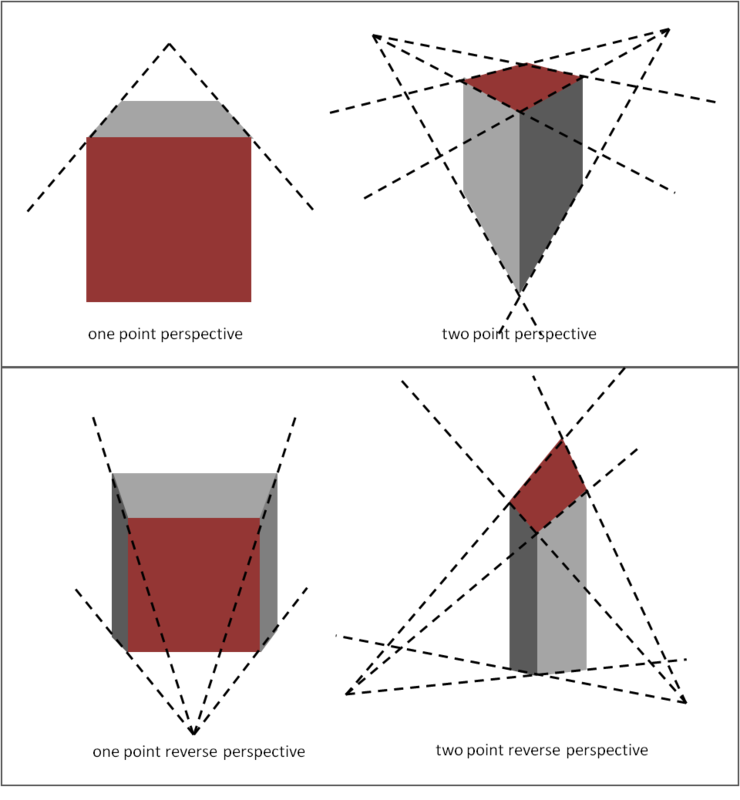 Though seemingly paradoxical, a similar claim can be made for other sufficiently small shapes such as a cubic die of which one may view four sides at the same time. Indeed, holding a die in close distance from the eyes and orienting it in a way that e.g. the 6 is on top and the 5 faces the observer, one sees at the same time a “4, 5, 6” arrangement with the left eye and a “3, 5, 6” arrangement with the right eye. The combined visual perception from the two viewpoints, one for each eye, presents the observer with a simultaneous view of four faces of the cubic die, a paradoxical picture that could not be produced by conventional photography. Both painting and photography are attempts of representing the world, perceived as a three dimensional Euclidean space, onto a two dimensional surface by accepting several fundamental principles. The geometric rules of linear perspective, first formulated methodically in the 15th century by the Renaissance polymath Leon Battista Alberti, were based on the unique viewpoint principle i.e. 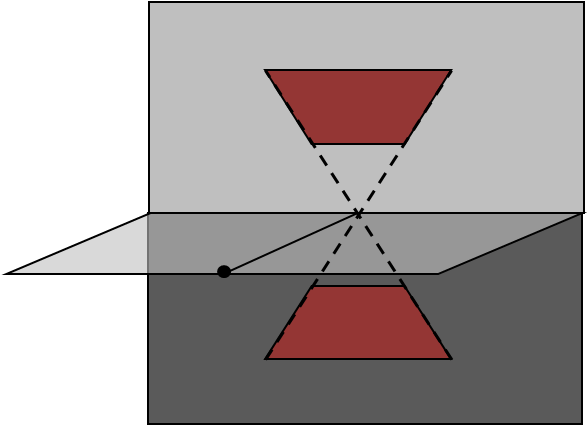 the convention of creating 2D images by selecting an arbitrary, unique point in 3D space and refer solely to the light rays reflected from the 3D subject towards this specific viewpoint. The 2D image is formed by the intersections of these converging light rays with a theoretical picture plane, representing the painting surface. A couple of decades before Alberti, the Renaissance architect and engineer Filippo Brunelleschi demonstrated the principle by drawing on a mirror the outlines of Florentine buildings. Since Renaissance and even until 19th century, artists have developed more sophisticated mechanical analogues, such as camera lucida type devices, to facilitate the exact transfer of 2D images from specific points of view. The concept is at the core of western art and of such significance that there have even been controversial claims (the so called Hockney – Falco thesis, 2001) of the sharp advances depiction accuracy after the 15thcentury being more the result of the parallel advances in optical technology (based upon the unique viewpoint principle) rather than the development of freehand technique and technical skill. Conventional and reverse linear perspective. A cube rendered by one point reverse perspective (lower left) displays four of its faces towards the viewer. According to the linear perspective theory, which is a natural result of the unique viewpoint principle, any set of parallel lines intersecting the picture plane should be rendered as a set of lines converging to a theoretical vanishing point, located at infinity, away from the observer. A consequence is that at most three faces of any parallelepiped can be simultaneously visible from any viewpoint, leaving Euclid’s observation outside of the conventional linear perspective framework. Therefore, in the context of the geometric theory upon which western art is based, an image of a cube showing four faces at the observer is simply impossible and paradoxical. Collecting light rays from a single, arbitrary viewpoint is a quite realistic convention, as this is the way a single human eye or a photographic lens works, yet it is still only a convention. It seems natural however, when exercising a form of art closely related to the divine and the metaphysical, to depart from realistic depictions and to seek refuge in abstraction. The art of Christian iconography evolved slowly after the third century A.D., employing standardized compositions, a symbolic alphabet of poses, gestures, colors and even purely abstract, geometric forms, such as the triangular representation of Holy Trinity. Holy beings, such as Jesus Christ, Mary or the Saints, are represented as non realistic, almost non material human, haloed figures with sharp outlines, sometimes rendered staring out of the icon directly upon the viewer, and clad in brightly colored, elaborately rendered garments displaying a geometric structure of folds. Shadowing appears as a natural part of each figure, irrelevant to localized, external sources of light. Physical proportions and relative sizes are often inaccurately rendered: infants are shown as downscaled copies of adults and even the reduction of sizes as distance is increased, an elementary hint of perspective used in a non methodical manner long before Alberti’s geometric formulation, is loosely employed with obvious inconsistencies. Before and after Renaissance, considerations about possible geometric rules of perspective seemed not imperative for Christian iconography: as icons were meant for worshipping purposes, their spiritual character was far more important than petty technicalities about perspective and the painter of icons was (and still is) more a communicator with God than a creator of convincing illusions. Quite surprisingly, throughout the history of Christian icon painting, several recurrent features indicate a tendency of reversing the rules of linear perspective rather than ignoring them. This unconventional rendering technique directly questions the unique viewpoint principle and is manifested by supposedly parallel lines converging towards the viewer, instead of converging towards a vanishing point at infinity away from the viewer. As a consequence, in some striking examples, reminiscent of Euclid’s unconventional observation on visual perception, parallelepipeds formed by architectural structures, thrones, pedestals, tables or stools, which are common elements in the standardized scenery of religious themes, turn at the same time towards the viewer more faces than expected in the conventional perspective framework. Though the basic structure of Christian icons is not linear, as it is concentrated on spiritual beings rendered as stylized human figures, a number of details standard in icons betray reverse perspective and not much research is required to discover such details in scores of examples. 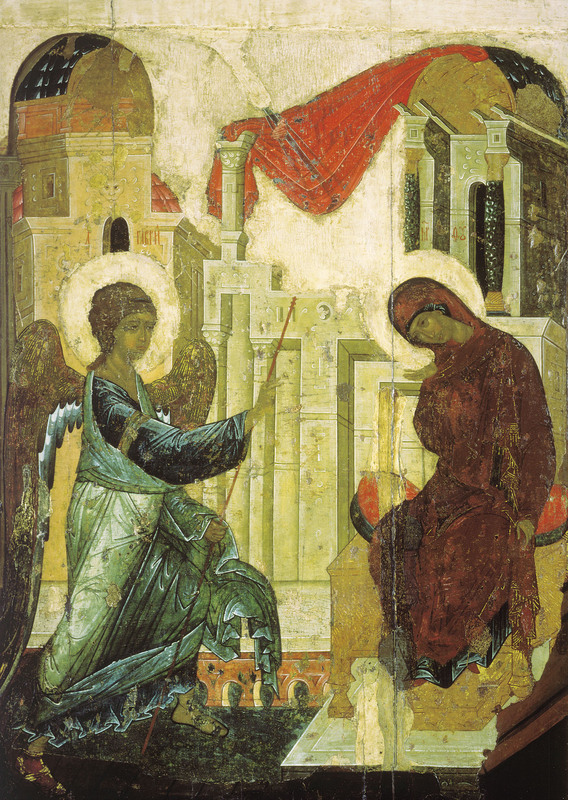 A rather illustrative example is provided by “Annunciation” (1405), a masterpiece of the great Russian painter of Christian Orthodox icons and frescoes Andrei Rublev (ca 1360 – 1429). In the complex architectural structure of the background, a pattern of supposedly parallel lines converging towards the viewer is recurrent while in a detail of the upper left part of the picture, a building turns towards the viewer more faces than it ought to according to conventional linear perspective. The pedestal and the throne, upon which Virgin Mary accepts from Archangel Gabriel the announcement of miraculous conception, similarly display reversed perspective. In “Ascension” (1408), also Rublev’s work, traces of a “pavimento” like structure clearly indicate a convergence of parallel lines towards the viewer and outside of the picture. The “Deesis” mosaic (ca 1261), a fine work of art in Haghia Sophia (early 6th century A.D.) displays Christ Pantokrator holding a Bible shaped as a parallelepiped with obvious reversed perspective. In the tympanum of the southwestern entrance of the magnificent church, Virgin Mary is shown amidst Emperor Constantine and Justinian I, standing on a throne of which the structure and pedestal bear apparent reverse perspective structure. Images such as these have obviously been created without accepting the unique viewpoint convention and, as far as the problem of perspective is concerned, probably without any systematic quantitative or structural convention. The reverse perspective elements found in countless icons seem not to be subject or result of a consistent geometric theory, yet their persistent appearance in Byzantine art and its offshoots in Eastern Christianity world is certainly perplexing. One may easily attribute it to naivety, a misunderstood or unsuccessful version of linear perspective, a result of failure to recognize the unique viewpoint principle that would inevitably point to the correct theory of linear perspective. The bad perspective could have dispersed and become mainstream due to some stubborn sense of religious tradition. It was not until early 20thcentury that artistic movements began to consistently question the unique viewpoint doctrine of western art. The cubist movement in particular, initiated by Pablo Picasso with “Demoiselles D’ Avignon” (1907), brought forward the possibility of the simultaneous rendering of the subject from a number of different viewpoints of 3D space or the even more advanced notion of viewing the subject from a unique point in 4D space, a unimaginable position that permits simultaneous views upon 3D objects from multiple viewpoints. Remarkably, this idea sometimes produces images with details not very different from the awkward, reverse perspective of Christian icons. 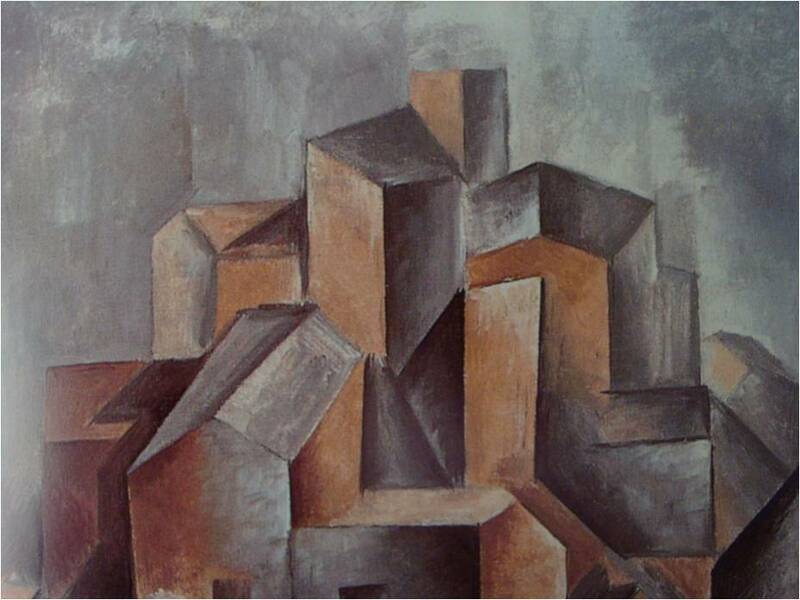 In Picasso’s “Reservoir at Horta” (1909), the landscape of the Catalonian town Horta de Ebro dissolves in a pile of geometric forms displaying awkward perspective. In several details, supposedly parallel lines converge reversely, towards the viewer, while parallelepiped – like structures permit the viewing of more faces than conventional linear perspective rules would normally allow. Similar features appear in Georges Braque’s “Castle at La Roche – Guyon” (1909) as well as in Robert Delaunay’s “The Tower Behind Curtains” (1910) where the pyramid – shaped, distorted Eiffel tower displays extreme reverse perspective. Pablo Picasso, “Reservoir at Horta – Horta d Ebro”, 1909 (detail). The Cubist technique, compatible to multiple viewpoints, results to obvious reverse perspective. A number of possibilities have been brought forward to explain the use of reverse perspective in Christian iconography, including the subjective assessment that the technique increases the sense of awe by creating the illusion of expanding images in the distance. Moreover, as the theoretical vanishing points are located at or near the viewer, the impression of being looked upon or encircled by God is emitted, alluding thus to God’s omnipresence. One point perspective of parallelograms above and below the plane of sight. The former display downwards convergence towards the vanishing point. Assuming that Christian iconographers were not altogether ignorant of the fact that parallel lines should be rendered converging towards the horizon, another possible interpretation arises. To proceed we do not need to accept that they were necessarily aware of the unique viewpoint principle. In conventional linear perspective the picture plane is separated in two regions by the horizon line, a line produced by the intersection of the picture plane with the plane of sight, which is a perpendicular plane passing through the viewpoint. Normally, the region above the horizon line represents the sky (or, from a theological point of view, the realm of Heaven as the dwelling place of God) while the region below represents the ground (the Earth). For simplicity I will refer to one point perspective parallelograms, parallel to the ground. The ones located below the plane of sight are rendered below the horizon and display upwards convergence towards the vanishing point. Similarly, the ones located above the plane of sight are rendered above the horizon and display downwards convergence towards the vanishing point. As a matter of fact, one may have discovered the upwards or downwards convergence without having necessarily realized the unique viewpoint principle and its consequences. The paradox in Christian icons, which is conceived as reverse perspective, arises from the displaying of downwards convergence for parallelograms that are obviously below the plane of sight. This could be interpreted as an intentional attempt to depict objects involved in religious scenes according to the Geometry of the Heavens, the realm above the horizon. Inevitably, images produced by this unconventional Geometry bear strong resemblance to images created by accepting multiple viewpoints. Rather than attributing it to naivety or simply bad perspective, this explanation of reverse perspective places the technique among the meaningful, elaborate vocabulary developed and employed throughout the centuries by Christian iconographers.